Designing or revamping your outdoor space requires more than just the right turf and plants; you need a smart hardscape design to tie it all together. What is hardscaping? Hardscaping refers to the man-made features, such as pavers, used in landscape architecture. Paving and stone can provide you with better use of your outdoor area through a stunning paved patio, or extended access to your garden using a stone path, and more! Pavers are commonly used in front and backyard designs, as they are incredibly versatile, durable, low maintenance and are available in many colours. Before you choose the landscape pavers to suit your outdoor space, we recommend speaking with skilled and experienced landscape designers to discuss your ideal garden look and feel. Do you want a sturdy garden path to lead you through your well-manicured plants, a driveway that compliments the aesthetic of your home or an al fresco area to kick back and relax in? Or maybe you’re after all three! The type, size, colour and shape will be determined by how you plan to use them – for example, if you’re using pavers purely for aesthetic design purposes vs wanting hardy flooring that will withstand heavy foot traffic. Whether you are a fan of natural stone paving or just looking for a simple way to include a timeless, classic look in your garden, limestone pavers may be for you. Limestone is particularly popular for use in landscape pavers as it is durable and cost effective. Limestone is incredibly versatile and can be used in more than just pavers; limestone walls, feature walls, planter boxes and even garden borders can add wonders to the aesthetics of your backyard. As limestone is a natural substance, each paver will have a unique look to it, however it will still perfectly tie together in your back or front yard. If you are looking for a long-term paving solution that is low cost and low maintenance, take a look at concrete pavers, which have a life expectancy of 50+ years! These pavers offer homeowners complete design flexibility, with a range of colours, patterns and shapes available to suit a range of design preferences, climates and uses. For a high-quality product that is strong, easy to maintain, environmentally-friendly and natural, look no further than clay pavers. Clay pavers bring that warm, familiar charm to your home and offer you flexibility in your design choices, with a long lifespan guaranteed. If you are looking to put in a path but you want to save money, a stone and stepper path is a charming inclusion in your backyard design. Stone and stepper paths are ideal for light foot traffic, giving you access to parts of your garden that may have been hard to access previously. To build a stone and stepper path, the steppers need to be laid an equal distant apart, with gravel, smaller stones, mulch or even grass in between to fill the gaps. 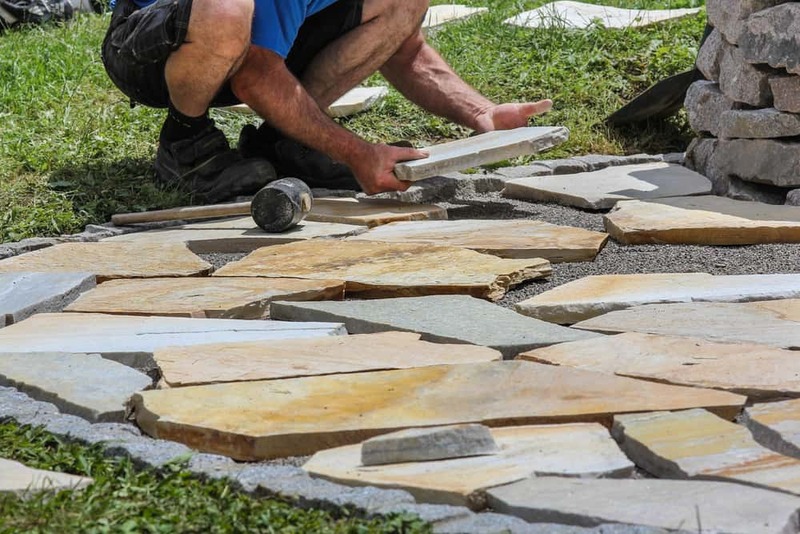 If you’re not up for DIY job or you want to make sure your new path ties in with the rest of your landscape design, you can contact Looking Good Landscaping to build your stone and stepper path for you. There are so many ways for you to add that wow factor to your backyard design with landscape pavers or stone and stepper paths and it’s important that it gets done the right way. Contact our friendly team at Looking Good Landscaping today to arrange a consultation and begin your hardscaping project!